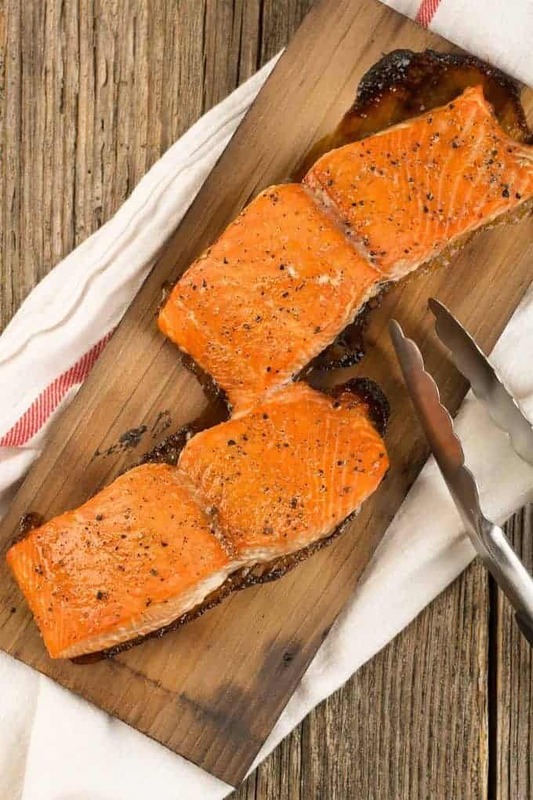 Grilling salmon on a cedar plank is a sure-fire way to produce moist, tender fish with a subtle smoke flavor. All that’s needed are a few guidelines for cedar plank grilling and a simple brown sugar rub for your fish. Get a clean, untreated piece of hardwood large enough to hold your food with a little room to spare. Soak the plank for at least one hour prior to grilling. Place the empty plank on the grill until it begins to smoke and char before adding your food. Close the grill and cook your food to desired doneness – no turning required! Grilling on planks has become so popular you can usually find them near the fish and meat counters of most well-stocked grocery stores. They’re available in a variety of shapes and sizes, but most often you’ll find them in a 2-pack with approximate dimensions of about 11 x 5-inches. That’s the size we’ve used for this recipe. If you search online, you can find other varieties of wood like oak, hickory and maple. 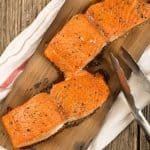 We think the mild flavor imparted by cedar is best for fish, but you might want to experiment if you decide to try the technique with some other meats. Soak your grilling plank in cool water for a minimum of 1 hour (see notes below for how-tos). Preheat a gas or charcoal grill to medium heat (350 to 400°F). Combine the brown sugar, salt and black pepper in a small bowl. Arrange the salmon fillets with the side where the skin was removed facing up. 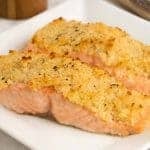 Rub a bit of olive oil over the surface of the salmon, then sprinkle with half of the brown sugar mixture. 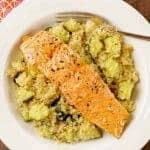 Using the back of a spoon, rub it into the salmon so it adheres well. Turn and season the other side with the brown sugar mixture (no need to oil this side). Drain the cedar plank and blot dry. Place it on the grill and heat until you begin to smell smoke and the side facing the flame has begun to char. 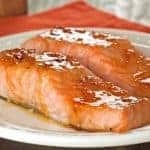 Using tongs, flip the plank over and place the salmon, oiled side down, on the plank. Cover the grill and cook for 8 to 12 minutes, just until the fish is cooked through. There is no need to turn the fillets. 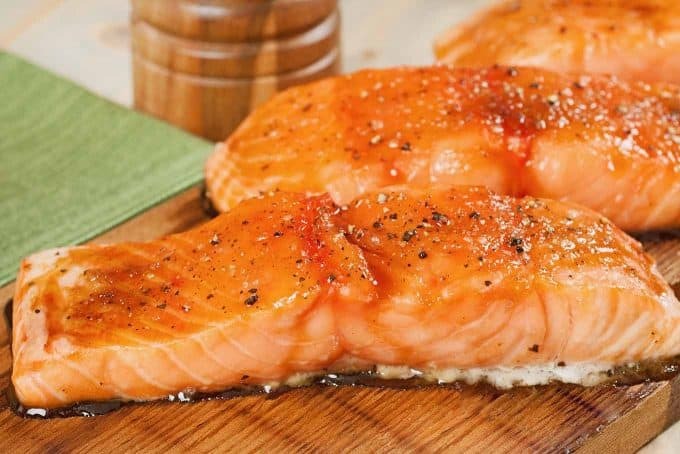 Allow the salmon to rest on the plank for 5 minutes before serving. Roasting pans and plastic coolers make good soaking vessels for grilling planks. Find something to weigh the plank down so it remains totally submerged in the water and turn it over midway through the time to be sure it’s evenly and completely soaked. We recommend that you allow one full hour for soaking time. 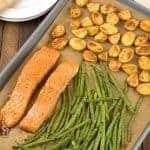 This not only helps prevent flare-ups, but the plank will produce more steam, infusing a richer, wood-smoked flavor to the fish. We use a cedar plank for nearly all our fish. Not only gives the fish a terrific flavor, but the kitchen smells wonderful. Will give this a try with the brown sugar. I agree, the aroma of the cedar is wonderful. So glad to see you back! Love the new improvements. That’s so nice to hear – many thanks! Thanks…looks delicious! I’ve seen cedar plank used more in cooking but have not yet tried it. It makes me wonder what the fuss is! I may have to teat it out with your recipe.